The magnitude of the Vijayanagara Empire is so vast, that I am mesmerized and in awe at the same time. This trail focuses more on the royal side hence rightly named Raya which means Royal or Maharaja. The Lotus Mahal, is located inside the Zenana (woman’s) quarter, built for the royal Women of the Vijayanara Empire. This undoubtedly has to be the most beautiful structure in Hampi. And to top off more known for the construction and engineering feat and stands a true testament to architectural achievements from that era. The region of Bellary is predominately warm and gets hotter during summers. The towers contained a massive tank and the water passed through the pillars of the colossal building maintaining a cool temprature throughout. During the raid of Hampi, this was destroyed due to curiosity of how the water pipes were laid inside. Nevertheless, this is a picturesque monument that depicts a lotus. 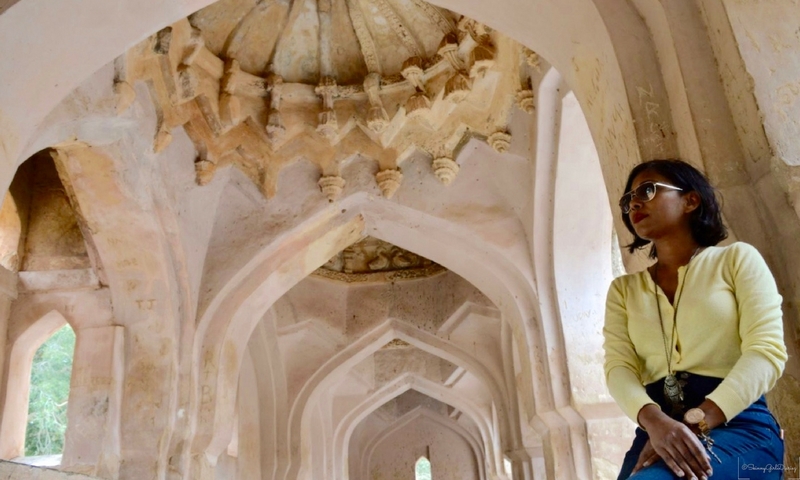 The name says it all, this indo-islamic styled architectural structure, was constructed by Achyuta Raya for the women of his royal family of the Vijayanagara empire during his reign. This is a rectangular shaped building, with a massive floor bath is in the center and the rest of its designed with elaborate ceilings and arched corridors and balconies and massive bay windows. The pool is open to the lit sky. Again a magnificent work of art. The intricate designs on the ceiling in the form of the lotus is beautiful. No matter which angle the photograph is taken it has golden hue to it. After the Queen’s Bath, you walk past through the Zenna enclosures and can see the Elephants stable. As the name suggests this stable was built for the royal elephants. This massive structure is a popular tourist attraction. There are about 11 tall chambers, shamed with huge domes on top. The tower in the center was destroyed however, the rest of it is very much in tact. The sprawling green lawn adds to the charm of this place, and one can only wonder how it was back in the day. My royal trip comes to a close for the day, it was just a fabulous trip, and I got to soak in some royal history. Just to be there was a treat, to visualize how it must have been back in the time when the royals lived. It was almost sunset and time to head back to the resort. One more trek was pending and I was anticipating the next day already. Read about my next and final leg of the trials via Evolve Back Hampi at the Tungabhadra river. I think my favourite is the Elephant’s Stable.. the architecture is just gorgeous! And your photos are so cute, love all the poses! the Lotus Mahal looks beautiful. I would love to walk around amid all that history. Do they still have Elephants roaming around the Elephant Stables? Love all the architectural details. So beautiful, and definitely lavish. Wow, the architecture of these buildings is stunning! I hope to see it for myself one day.